Very unique and eco-friendly jute totes. Love the design you guys made for me. My bags came out way better than I had anticipated. I am very happy with the final product. It was a long process because I wanted a custom unique bag for my event. But in the end it was perfect. I would order from them again based on this current success. Great value, you will not find a better price on the internet for a quality jute bag. I used there design department to design my bag for me. I was happy with the finished product they did an excellent job. This was an freebee we gave to all attendants at a industry event. It was received well by all. This is the exact bag I was looking for. I came across it just by googling reusable Jute Tote bags. I am very happy with this company custom earth promos, they helped me place my order and I love the bag we got!! Quick turnaround on our order. I expected to receive this bag alot later then we did. I love the look of the bag, I just wanted to get it laminated to waterproof it. Excellent craftsmanship, I will be ordering this bag again. I ordered this model for our annual summit from all branches across the US as a giveaway to commemorate the event. Excellent bag, we were proud to bare our company brand on this product. I order this bag once a year for a school program we run after school hours. All of the students who join the club receive this bag to bring awareness to the club and they actually use it all the time at the school. I get most of our new members thru them asking questions about where they can get a bag. The lime green color I thought was going to have more "pop" to it, I thought it was going to be more Neon. It is a well made bag but I just wish the color was more attractive. Very Eco friendly bag from the material to the dye in the ink they use for the imprint. The bag also has a very earthy Eco conscious look to it. I highly recommend this bag. This was our promotional "swag" bag at an event we hosted, absolutely everyone loved it there were zero complaints. This is our standard shopping bag for our farmers market. It is beloved by all of our customers. The look and the feel of this bag is cool, that is why we ordered it. We are happy with our purchase. I think that this bag can be a little bigger, I did not know that you can customize a bag that you like to whatever size that you want within reason. Next order I will do this because I like the look of the bag and I like the print. Exactly what you think it is, it is a affordable wholesale reusable Jute bag. The service is what separates custom earth from the pack, I would use them again based on this experience. Received yesterday the whole entire order in full. Everything seems to be the way I ordered it and of quality manufacturing. I work as a international business man and do a lot of travel and require a lot of promotional items all over the world. Custom earth promos has been a great resource for me with all of the logistical solutions they have provided for me. I have had orders split to go to separate countries, I have had products shipped all over the world with them. I must say out of all the orders I have placed with them for promotion all over the world, the products are consistent whether they are being used in London or South Africa. If you do international business and have a need for promotional items like most companies do, use custom earth promos they will save you a lot of headaches. 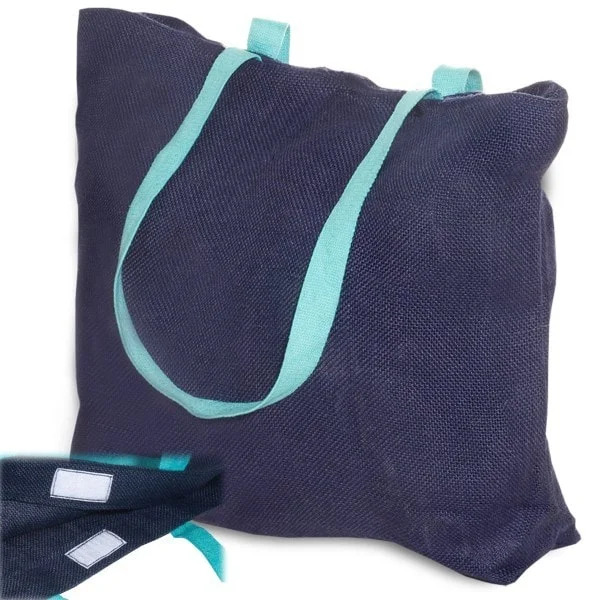 Navy color looks great with contrasting cotton handles. It is very durable and comfortable to carry in your hand. I carry groceries all the time in this bag. The handles are strong. We sell this at my store to promote our brand. The customers use and reuse it all the time. Incredibly affordable for such a well made bag. Overall I rate my experience in business with custom earth promos a 4.8. Nothing is perfect but this was close as it can come when it comes to ordering a reusable jute bag. They made the design process simple, the billing very clear and to the point. and the product was outstanding, very nice bag. I would recommend custom earth to a friend and trusted business partner. Black bag looks amazing with a white print. Very attractive and it stands out. Look no further than our Jute Reusable Eco-Friendly Totes for a unique blend of colorful, eye-catching style and unrivaled functionality and space! Each tote offers an attractive two-tone color scheme which aids in prominently exhibiting the design you choose to emblazon on the large imprint area allowed. Those observing your clients’ totes will be struck by its appealing nature and your brand’s design! In today’s competitive business environment, brand recognition is crucial in conveying to clients (and potential clients) that your company cares about their satisfaction. Why not complement your company’s brand initiative with an affirmative message that you care about the environment without sacrificing the overall quality of the product? 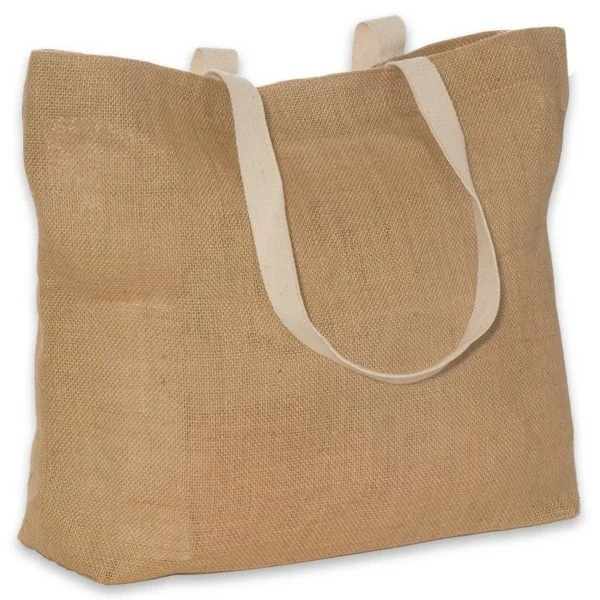 These Jute Reusable Eco-Friendly Totes are the idyllic solution, offering material quality, aesthetic supremacy, unsurpassed functionality, and biodegradability. Our Jute Reusable Eco-Friendly Totes are the ideal product for proudly and explicitly showcasing your brand’s image or statement! With a considerably generous 9” W x 8.5” H imprint area, clients and non-clients alike will be drawn to the striking design that encompasses a large area of the tote’s 17.75” W x 13.75” H x 4” D overall size. Similarly, the sizable quality of the tote lends itself to many usages for your clients and you will find that they will carry this tote wherever they travel, spreading your company’s message to a large demographic audience. The 4” gusset only further supplements the space that this remarkable tote can offer. The strength, reliability, and durability of these Jute Eco-Friendly Totes are among its most distinguished features. They arise chiefly due to the material employed in their manufacture: jute. The jute fiber has been prized for centuries for its tensile strength, lightweight properties, and, arguably most importantly, its eco-friendliness. As a result, your clients will be proudly carrying this tote for years to come, spreading your message as well as an environmentally and ecologically sound message. In terms of coloration options, you may choose from one of four prominently vibrant colors: Natural, Black, Lime Green, and Navy. The dye used in the coloration process is azo-free in that it does not contain azo, a chemical implicated in cancer and other negative health complications. 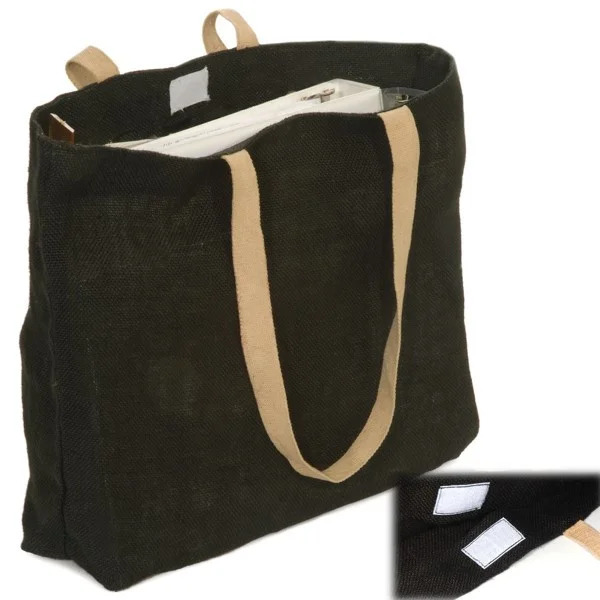 In terms of functionality and comfort, each Jute Reusable Eco-Friendly Tote is equipped with a pair of lengthy 24” cotton handles (which allow for easiest adjustment and optimum carrying comfort) and Velcro closure to ensure that your clients’ belongings stay securely within the confines of the tote. Each Jute Reusable Eco-Friendly Tote is fully customizable. It is imperative for us that each order is completed to your satisfaction and we accomplish this compulsory objective by designing each tote exactly according to your design specifications and getting you the order within the required time. We are lucky to have a custom manufacturing facility at our disposal which is incredibly proficient at producing your design requirements with high quality.